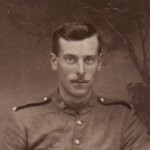 On 12 July 1915 Frank Clifford John Mason, an only child living with his mother and stepfather, lied about his age in order to enlist in the British Army and join the war effort. He was born in September 1899 and was two or three months shy of his 16th birthday. He claimed to be 19, and this was accepted. A little over a year later he was dead. 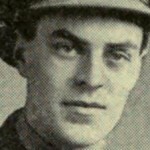 Frank’s birth father was also called Frank Mason and was described in the 1901 census as a “manager specialist”, then aged 58 and born in Pimlico. The 1891 census lists him as a “chef & manager” and shows that he had a previous family. He was married to Esther, at 54 seven years older than himself, and there was a grandson, one-year-old Thomas F. M. Tickling. The family lived at 22 Stansfield Road, Stockwell. 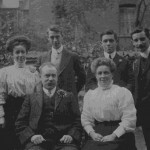 Some time after 1891 Frank senior became a widower and in 1899 he married again, this time to Maud Mary Mason from Ipswich, who was almost half his age. Soon there was a child, the Frank listed on the Memorial. 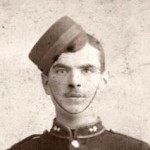 But Frank senior died in 1904, leaving Maud a widow and Frank junior without a father. Less than two years later, in 1906, Maud married again, this time to a man considerably younger than herself. Arthur Petherick, shown as 31 on the 1911 census, was a railway clerk born in Dorking in 1880. The family, Maud, Arthur and Frank junior, now lived at 22 St. Michael’s Road with three boarders. 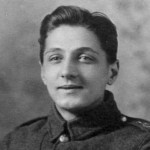 On 12 July 1915, less than 12 months after the war started, 15-year-old Frank joined up. He claimed to be a 19-year-old clerk. Mason was puny, even by contemporary standards. The examining officer described Mason’s physical development as “slight”, and he stood only 5 feet 4 and a half inches tall with a 32½-inch chest. He was immature emotionally as well. While training at Northampton, in March 1916, he was in trouble for insubordination and for making improper remarks to an N.C.O., for which he was punished with 14 days’ detention. But the war was soon over for Mason. 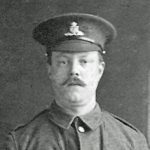 He was posted to France on 21 April 1916 and just over four months later, on 24 August, he was killed in action, having served a total of 1 year and 44 days. He had not yet reached his 17th birthday. 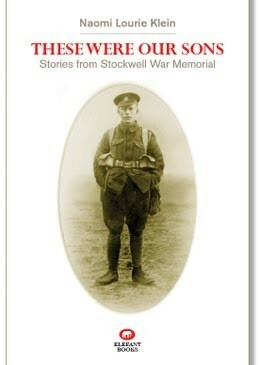 On 28 August 1918, Frank’s effects – photos, disc, diary and postcards – were forwarded to his mother and stepfather. The army asked for acknowlegement of receipt, but Mrs Petherick replied questioning the whereabouts of her son’s other possessions. “I wish to point out,” she said, “that seeing these other items were recoverable from my son’s body, there were other things such as watch, cigarette cases, fountain pen etc which should have come to hand.” In common with most of the rest of the civilian population, she had no real understanding of the conditions soldiers were fighting in. Maud herself did not live long after this. 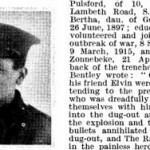 The records show that a she died in March 1919 in Epsom, Surrey and by March the following year Arthur Petherick, Frank’s stepfather, was answering the war pensions board’s queries. He stated that his stepson had never been married and had no siblings, half-siblings, grandparents, nephews or nieces or children. Frank’s half-sibling from his father’s first marriage is not mentioned. 22 St Michael’s Road, 11-year-old Frank Clifford John Mason’s home in 1911, is described as a 7-room tenement. He lived here with his mother Maud Mary Petherick, 37, from Ipswich, Suffolk, and stepfather Arthur Petherick, born in Dorking, Surrey and 3 boarders.